What a strange month May was this year! It seems that every time I had a day off work to go out nature-watching, it was either rainy, cold, windy, or dark and gloomy; none are good conditions for bird photography, and of course butterflies and dragonflies were scarce, if flying at all. Nonetheless, I was able to visit a few places and take a few photos to share with you. To start out the month, my aunt from California flew in to Richmond for a couple of Roads Scholars trips (previously named Elderhostel), and I spent the weekend and my birthday with her in Richmond. On Saturday we went to Maymont Park (photo above), but spring had not yet arrived there; it was cold and cloudy. It’s a gorgeous park, though, and I intend to go there sometime in the summer; it has lots of possibilities for butterflies and dragonflies. On Sunday we went on a pontoon boat Bald Eagle tour up the James River with Captain Mike, owner of “Discover the James” (http://www.discoverthejames.com). I highly recommend his trips; his pontoon boat seats six participants and he drives it about seven miles along the James pointing out the wildlife along the way. The focus of our trip was Bald Eagles, and they did not disappoint; we saw about 7 or 8 of them. Mike knows them all and their territories, as he has studied them for years, and knows where to find them. Unfortunately for me, it was another dark and dreary day, and the eagle photos I took are a bit dark and blurred — but I’ll share one anyway. The first photo below is of one of the Bald Eagles in flight clutching a fish, and the second is a Great Blue Heron that has just grabbed a fish that Captain Mike threw its way. On the home front in Chesapeake, breeding season is in full swing. I have a bird house in my front yard that was investigated early in the month by Chickadees and even Eastern Bluebirds, but in the end a pair of House Wrens won the battle for it, and have built their nest inside; I should hear the babies soon. One of the House Wrens that won the battle for the bird house. An interesting fact about House Wrens: the males arrive on their breeding territories earlier than the females, and spend their time building multiple nests to impress the females. When the female arrives, she will hop from nest to nest to nest, and finally pick the one that strikes her fancy. Or desert to the neighboring male if she likes his nests better. I should have kept the female in the cage with the leaves of her host plant (Oak), so she could lay her eggs and I could raise more caterpillars; this is what most other butterfly and moth enthusiasts would have done. But the adult Polyphemus Moth, like most of the other large Silk Moth species, lives for only seven days, and I just didn’t want her to die in my cage. So I left the cage door open one night and all the moths left to complete their life cycles in the wild.This is also the time of year that Luna Moths, another of the Silk Moths, emerge from their overwintering cocoons. Below is one that we found on the library’s outside brick wall. 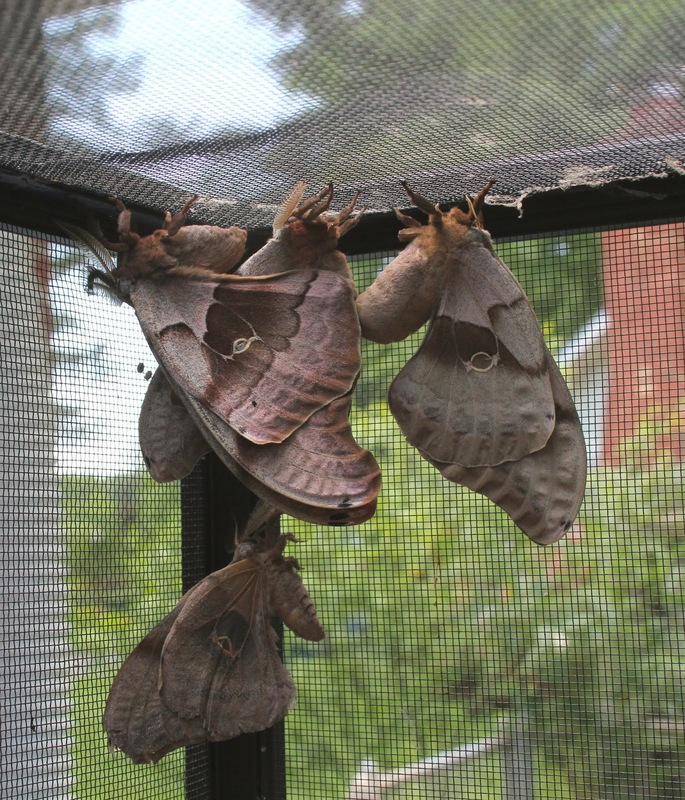 Like the Polyphemus Moth, Lunas emerge, breed, lay eggs, and die within a 7-day span. They do not eat or drink in the adult stage; their sole purpose is to reproduce. On a warm day in mid-May, I took a short walk along the Dismal Swamp Canal Trail in Chesapeake. If you haven’t been there, you should go check it out. An 8.5-mile multi-use trail runs along the Dismal Swamp Canal, paralleling the old Route 17 to the North Carolina border. It is used by nature lovers, runners, bicyclists, and all manner of outdoor enthusiasts. (Check out the website at www.cityofchesapeake.net/DSCT). I generally prefer to bird on the less populated west side of the Dismal Swamp, accessed in several places from Suffolk, but the Canal Trail is a nice, quick, easy place to access some of the Swamp’s unique habitat if I don’t have a lot of time to travel over to Suffolk. Red-spotted Purple does not have the “tails” that the Swallowtails do. I threw in the photo of the Gnatcatcher because I’ve been trying, unsuccessfully, to get a decent photo of one, and I finally did. 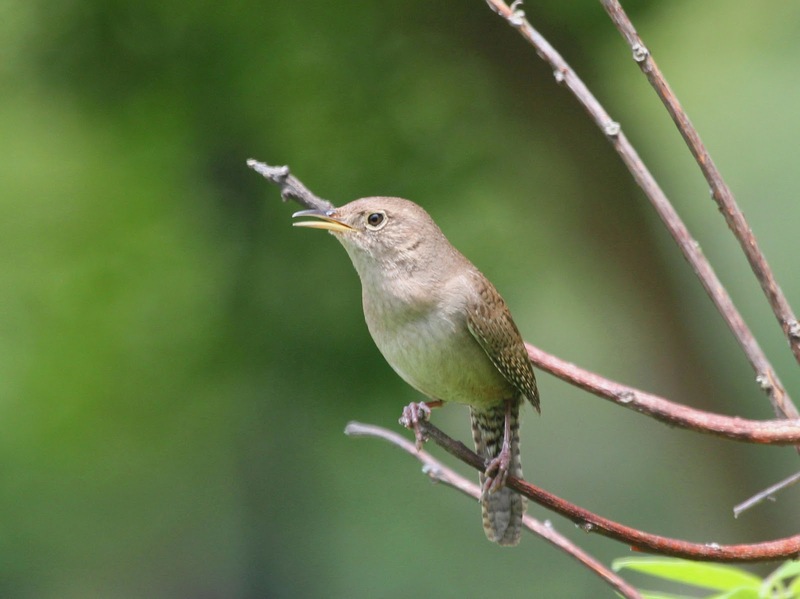 These tiny little birds are almost everywhere in the spring and summer months, and you’ve undoubtedly heard them even if you didn’t know it; they have a soft wheezy, nasally, rambling song. These little guys are very active, like Kinglets, and are usually flitting about high up in a tree. They are also very curious; if you make “pishing” sounds, they will usually come in closer to investigate you, which is what the one in my photo did. So, here comes summer now, and I hope that the excessive rains we had in May finally cease! If they do, I’ll be out looking for birds and insects to photograph at Mackay Island, Piney Grove, Back Bay, Maymont Park, and hopefully some places in the Piedmont and in the Blue Ridge; the more different kinds of habitat you visit, the more possible species there are to find. I’ll let you know what I saw next time, and if you want to share your own sitings with me, please feel free to comment. Or better yet, bring your photos to my next “Nature Photo Night” at the Chesapeake Central Library, which will be on Monday, July 29 at 6:00 p.m. Call me at 410-7147 if you would like more information about this — ask for Karen.